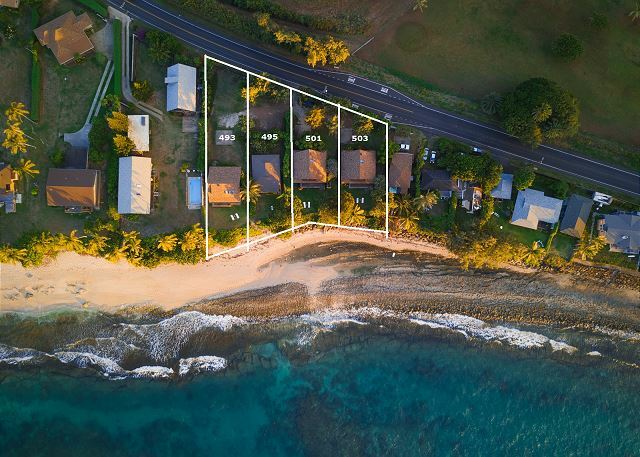 Live your dream in paradise as you wake to the sound of the Pacific Ocean at your doorstep in this 3-bedroom 3-bath beach front home.One of four beachfront homes ideal for family reunions or small weddings. We rented three of the homes, and they were all beautiful! Two of the homes were newly renovated, which was a nice surprise, and they were all very clean. The owners are also very nice, and were there to help us out with whatever we needed (even when we accidentally locked our marriage license in the safe on the day of our wedding! They were over to help us in no time.) The view can't be beat, and it's the perfect backdrop for a beach wedding! Every morning we were whale watching on the porch and hunting for shells and corals on the beach! The houses are next to great food trucks and beach spots. There is literally nothing bad I can say about this place or about the rental company that handled the reservations and check-in/check-out. They made our trip, and ultimately our wedding, a perfect experience and memory! Our only issue was that we couldn't stay longer. Stunning ocean view and sunsets! Overall the house fit the needs of our large family gathering of 8. The views from the mater bedroom, the livingroom, the deck and yard are absolutely stunning! The large master suite was where I slept, with modern bath and great view even from the shower and i was delighted with it, (But could have benefited from a dresser for clothing, and a side table by the bed). While the master is heavenly, with sounds of the ocean, the other 6 sleeping spots are on the road side and the road noise was quite bothersome to sleep with. A few other suggestions...the fan in the sleeping area on the backside of the master did not seem to work. The board above the lower cabinet fell off upon opening the cabinet, needs to be repaired, (we saw a small “b” written on it as though it was known to be broken, but not yet fixed. The motion detector lighting does not go on, so if not fixed, bring a flashlight. The kitchen was well supplied and lovely. The outside shower is great! The house was clean. We loved the chickens and roosters, and the stargazing was fabulous! Family time right on the beach!!! Such a special place watching the sunset, reading, spending family time & exploring the North Shore. Tom P from Franklin, TN does not recommend this vacation rental. This property is in a good location with a lovely view of the ocean, that’s about the best part of it. Property is dated and not well maintained in my opinion. Also, the listing stated the property has a/c but what that really meant was a window unit in the master bedroom. There was no other a/c in rest of house. Internet service was buggy, not working on/off. Not a huge issue as we were there for the scenery/beach but my wife is self employed and did need to get some work done while we were there and we had to use our cell phone as a hotspot at least twice. The rental agency (team real estate) had good communication throughout so no complaints from them. I just think the owner of this property needs to do some maintenance work on the house. This was a great home for our base camp on our family vacation, spacious, clean, comfortable, and quite. We seen whales from the homes deck on a few occasions. enjoyed snorkeling, and beach combing out front of this home. wonderful fruit stand minutes from the home. Only a 20 min drive to great restaurants and shopping. Team Real Estate was easy to deal with and very informative with instructions and directions. The only thing I would suggest is the blender did not work and the sliding screen down did not really want to slide well. But over all Thanks Team Real Estate!! Aloha, We are very glad you had an awesome vacation and even got to see some whales from the deck. Thanks for letting us know about the blender, we have replaced it. The location was amazing. It was so awesome to whale watch from the porch. We loved the convenient access to the beach. The house itself was clean but needing some updating. 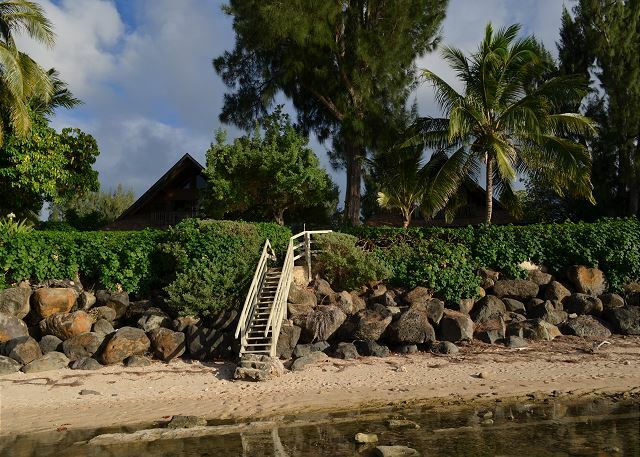 The house is located in a fantastic area where you can travel all over the island. You need a car or moped. The view is spectacular and the outdoor shower was perfect. The whole house needs a facelift however. Some doors were hard to open, the light over the upstairs bed didn't work and the chairs in the dining area need to be replaced. Despite this I would stay here again as the atmosphere is what you make yourself. There were 7 of us and we had a great time making many different meals and enjoying the whole experience. If you stay here it is not Turtle Bay but a far better experience. You have your own beachfront view which has spectacular sunsets. The location of this home on the shoreline is lovely. The layout of the house and the ample furnishings inside and out made for comfortable relaxing, dining, and socializing for the eight of us. However, the bathrooms were not clean, carpets were worn and stained, window blinds were broken, and box fans were not adequate in number and/or repair for moving air through the interior. A little cosmetic repair and attention to cleanliness, especially in the bathrooms, would elevate this beach rental to an exemplary standing. 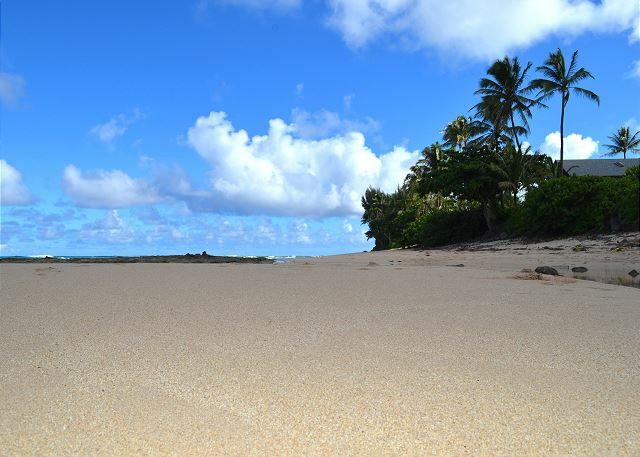 We loved the mellow and spacious beachside Hawaii vibe. We just returned from a week's stay at Kawela Kai with 2 other couples. 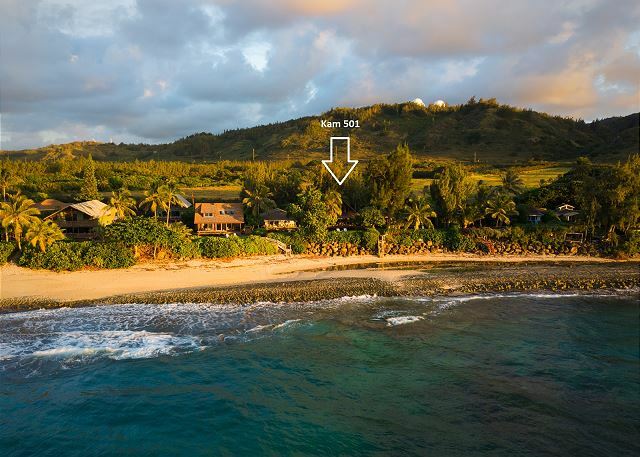 The location is awesome, and was central to everything we wanted to do in the area, such as visit the PCC, snorkel at Shark's Cove, Haleiwa shops, North Shore dining (umm, Ted's Bakery was only a few minutes away... a must do), surf lessons, etc. It is beachfront, although not with much of a soft-sand beach... it has a small sand stretch with mostly volcanic rock. You can walk or run the length of the beach on that sand stretch, though, for quite some time. The views are amazing as is the sound of the ocean through the ocean-front windows. And the regular visits by a local rooster... who thankfully didn't crow in the mornings... and a few hens were a fun addition. On the downside, the property is definitely in need of some updates, and a day after arriving we realized the fridge wasn't working. It took another 2 days for the repair, so we had to throw out a case of yogurt and some chicken we had bought. (We found that most things operate on relaxed "Hawaiian time" on the north shore, and the repair guy was no exception.) I will say that our rental agent Sophia was extremely nice and good to work with, even if she couldn't get a repair guy more quickly. Overall, it was a great setup for the 3 couples as our "home base" for activities. 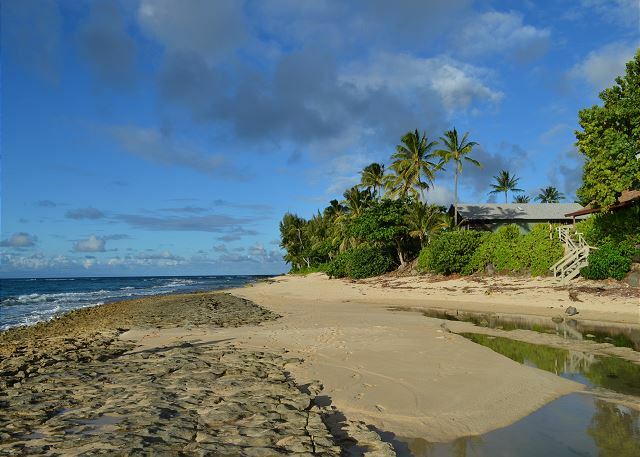 We had looked at other properties both on and off the beach, and were very glad we ended up booking Kawela Kai because of the beachfront. Who doesn't want to wake up and go to sleep nightly with the sound of waves, and gorgeous Hawaiian sunrises and sunsets over the ocean? The cabin on the beach was perfect for our group. It was so nice to have a place to retreat to after seeing the sights in the city. The food was amazing. We shopped the farmers markets, bought fish from a rd side vendor, and tried all the strange fruits I could find. We loved the town of Haleiwa. We live on an Island with a sea side town very similar. The people we very nice and we will be back. We stayed only 4 days and really enjoyed the location on the North Shore. Haleiwa has been a favorite of ours but lately it's become more popular, thus more population. This house is further north so out of the "congestion". The road noise is quite loud on one side of the house and the waves are loud on the other - it takes some getting used to. The house itself is generally well maintained. The kitchen knives desperately need sharpening, vent hood works but is very dirty, floors could've been cleaner. Overall, it was a positive experience and we enjoyed our stay. We stayed at 2 homes, next to each other, on the North Shore beach, and just loved the convenience and the beautiful view from the back porches. Great place to spend a Hawaiian vacation. House was in great shape and the Team Realty staff was very helpful. Skip Turtle Bay Resort. Live Here! Our family had a great time here. My wife, mom and newborn (4 weeks) stayed here for 3 nights. We had a wedding to attend at Turtle Bay Resort. We were glad there were two floors and at least one of the rooms (bigger room) had A/C. My mom enjoyed the 2nd floor. With the fans on, it was nice and cool, even during the hot part of the afternoon. You cannot beat the view. My wife's parents and extended family dropped by for lunch and expressed how amazing the view was and how it brought them back to their childhood by the Pacific Ocean in Kaoshiong, Taiwan. If we ever came back to Oahu and the North Shore, we would definitely stay here again. Again, location was fantastic, couldn't be better, especially during sunset. Service was very good. It could use a nice check in phone call to see how things are going. More clear directions, such as: highlight areas of return key and using lock on gate (press code then press down and then pull up). Cleanliness-overall clean. Bathroom smelled like bleach. 1) Consider adding fans to the first floor to improve circulation. This will keep the first floor cooler. Many times we found the 2nd floor cooler than the first floor. 2) Consider updates to both bathrooms and kitchen. These areas definitely look dated. You would even get better rates. The North Shore is a must for anyone who wants an alternate experience to the typical Waikiki vacation. With only one resort, a beach house is an ideal way to live like a local. The house we had was great - we were a party of 6 adults and the accommodation was perfect for us. It is typical of the area - not 5 star but that's not necessary. The house had everything we needed in a perfect location. Our stay was delightful in every way. The house was in an excellent location and was in very good condition considering that it is located on the beach and subject to salt air. It was very comfortable for my family. There were six of us but the house could probably have accommodated ten guests comfortably. I would definitely recommend this vacation home and I would consider renting it again in the future. My 4 sisters & a sister-in-law planned a sisters' trip and this house was the perfect location. We had access to many beaches and were nice and close for a major surfing competition. There were plenty of beds (which were very comfortable) and the ocean breezes were great. Mother Nature gave us a show with the biggest waves seen in years - when we had questions related to that, the owners were very quick to respond. I would go back and rent this same property again. The house and property was very nice. The view of the ocean off the back deck was breath taking. Our stay was enhanced by this beautiful location. What a nice location on the island especially in the winter. There is usable beach most of the time and when the water is low it is really good to walk the beach. The house very accommodating with the large common area. The views are incredible and the yard was great for enjoying the roar of the ocean while relaxing in the lawn. The house was very clean and easy to keep clean. We had a problem with the TV which was taken care of very quickly. We couldn't be more pleased with our stay. Our visit was in mid January, 2016. My husband and I rented out all four houses for our beautiful wedding. Our family who stayed in the venue enjoyed these beautiful homes. This particular home I used to get ready for my bridal party and myself to get ready in. The pictures turned out beautiful when we took pictures on the upstairs balcony. We setup our wedding party in front of the house and used the patio for head table, which turned out beautiful. Each property had it something on it. In addition, I would recommend House 1 or 2 for your the couple because upstairs is more private and intimate. House 2 has beautiful view because you do not have a big tree blocking half of the view. I also recommend that you have good signage with lights to let your guest know where exactly it is located. Some of guest had a hard time finding the place. I would totally recommend this place as a vacation rental and/or wedding venue. We brought our three children to Oahu and this beach house was great! It had a great location. We did many day trips and most were only 1/2 hour from the home. Although, we didn't swim often on the beach located in front of the house, we did explore, found sea glass, enjoyed checking out the tide pools and just taking long walks on the beach. The house was comfortable and the loft was perfect for the kids. Every evening Mother Nature gave us a show of beautiful colours in her amazing sunsets! On the day we left, we were treated to a multitude of rainbows over the ocean. We discovered a great sandy beach that was accessible just across from the fruit stand north of the house. There were also amazing walking trails there that were connected to Turtle Bay. We would definitely return to this location and would highly recommend it to anyone with kids! Beautiful home with a gorgeous view. This was my first trip to Hawaii and I couldn't have hoped for a better experience! The house's location couldn't have been better and the staff (not to mention the owners) were very courteous and professional. Don't waste your money on a hotel- book this home as soon as you can and get a taste of paradise! I sure will! We LOVED the location (though difficult to find in the dark the first time if you're not coming from the rental office-no real signs or large addresses to see. AWESOME location, beautiful views (we watched whales from our deck! ), tranquil and the home is in very good shape! We couldn't have asked for anything better.. The stress of past few weeks just floated away!! Kathy( rental agent) was very fair, very professional, very informative; all information and photos on house 100% accurate; a home away from home except with the fantastic oceanfront views. We are already planning to return! What a perfect paradise found at Kawela Kai. This particular home was wonderfully comfortable, suitably equipped for every need, and very well appointed. 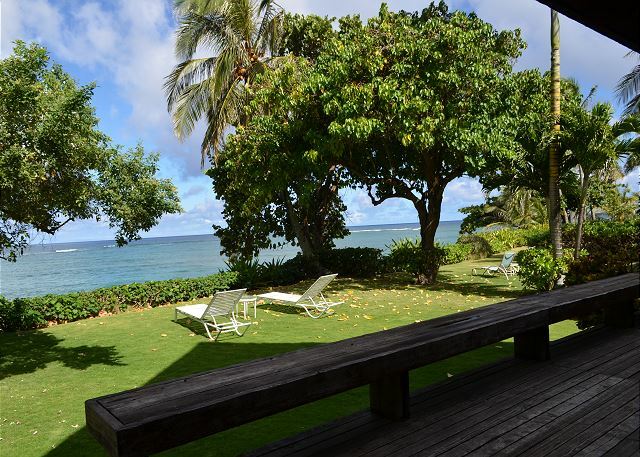 Easily accommodating my family during our lovely stay on the North Shore, it is located right on a secluded beach with front row seats to beautiful sunsets, rolling ocean tides and surfers, private viewings of critters such as turtles and crabs, and shell collecting to your hearts' content. We were far enough away from the noise/traffic of the popular North Shore beach hangouts but close enough to easily reach them if we wanted to. We plan to return often and hope to stay much longer next time. A very heartfelt thank you is in order to the owners for opening their beautiful home to us, and to the property manager for attending to every detail and making it a great vacation for us! Very good Team Estate great to work with ! Our entire family, consisting of 2 grandparents, daughter's family (4) and son's family (2) stayed in the rental. It fit us well, with plenty of room for the three combined families to co-exist. We enjoyed the holiday meal on the deck with two guests (cousin and wife from Oahu). The internet service was spotty to non-existent. Unplugging and reconnecting the modem corrected the problem for a few seconds only. TV [cable?] and wireless were fine. We suspected a failed modem. Great Hawaiian Vacation Right On The Beach!!!!! This is the second time we have stayed in these rentals. All I have to say is that I would not stay anywhere else but here. Everything is fantastic from the view, the cleanliness of the rentals, the amenities inside the units, the staff, and the whole North Shore. You couldn't ask for a better place to stay on your vacation. I definitely will be back in the future. relaxing, except for the hurricanes. The house was as described. We found everything we needed. It was close to the beaches we love. The view was great, the sunsets incredible. The beach directly in front of the house was not sandy, but the tide pools were fun. You could walk a short distance to easily enjoy swimming in the ocean, we snorkeled. The outdoor shower was great. We loved watching the geckos. There were some cockroaches, but that is part of a tropical environment, it was clean. The rental process was easy. We would return and recommend the house to friends. We are 40-year residents of O'ahu, but not on a beach. This was our third visit over 16 years. We were not disappointed. The place is in good shape (other than the fridge running cold and the dishwasher needing to be anchored to the cabinet. We will return again someday. The location is fabulous! The furniture, mattresses, flooring looks like it has had a lot of wear. The smell was a little musty. Maybe that is part of the humidity of Hawaii. One of the upstairs ceiling fans has a loud squeak or rubbing sound to it. Some of the dishes did not seem very clean. We rewashed a lot of them. We had a great time and enjoyed the setting immensely. We had a large leak under the bathroom sink. Team Real Estate was very prompt at getting a plumber out to the house and repair was done the same day. That was very good service. Thank you for your iquiry. Good location, spacious and very well maintained. Beach access was only a few steps from the deck and the ocean view was clear from both floors . Only negatives were the traffic noise ( quieted after 10 pm) and air conditioner was only in one room. Management group was excellent to work with. Kathy Sanders helped me and was fantastic. nice spot for vacation, can hear the waves at night in the back of the house, however, very noisy in the front of the house because the bedrooms are facing the street. overall, it is a wonderful place to stay. We rented 3 of the properties next to each other for our families and for our wedding. It was perfect! 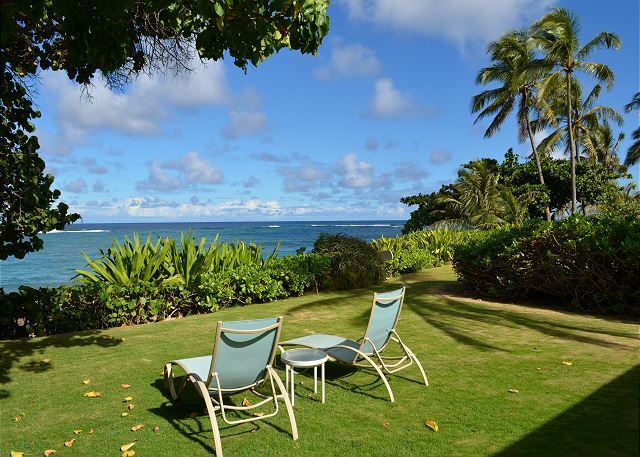 We would totally recommend it to anyone wanting a relaxing Hawaiian vacation! area. It was quite a shower during dinner. We should consider recommending this home and would stay again. Thanks. We were lulled to sleep each night by the sounds of the ocean. The winter swells were magnificant to witness. The house ws well appointed with towels, bed linens, kitchen supplies and even some beach toys for our grandson. I would definately return to this house for future vacations.